The growing demand of network bandwidth indicates that user access to high speed (i.e. ATM) networks is a key issue. The Inverse Multiplexing for ATM (IMA) is a technology that combines multiple T1/E1 links to support the transparent transmission of ATM cells over one single logical data trunk whose bandwidth is the aggregate of the T1/E1 capacities, minus a small amount due to overhead. That is, it provides high bandwidth by using already deployed WAN infrastructure and at a reasonable cost. Employing this technology, it is possible to dispose of ATM connections with data rates between the T1/E1 (an economical but sometimes too slow option) and T3/E3 ones (with high bandwidth, but expensive for the mass market of users). 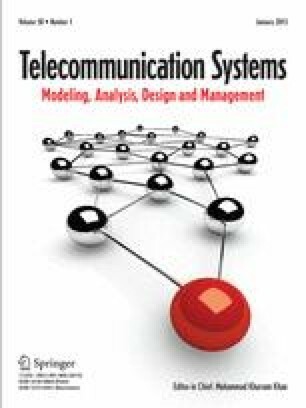 In this framework, and facing a new technology, it is crucial to have tools (analytical and simulation ones) easy to manipulate that help telecommunication engineers and network planners on the performance evaluation and dimensioning of these systems. In this paper, the fundamentals and major applications of IMA technology are described. Also, the behavior of IMA multiplexers is carefully analyzed and a method to dimension them proposed. An estimate for the Cell Loss Ratio (CLR) and the mean waiting time measured in the IMUX devices are obtained. The analytical study is based on the comparison with a M/D/1 queue system. Even though, we are aware of some weakness of our assumptions, especially concerning the Poisson input traffic, the model is compact, easy to understand and to manipulate, therefore it can be valuable to validate simulation models developed to evaluate IMUX devices under more realistic input traffic patterns.